Download "Delaware PAGE I. The First State"
3 shall be elected by the stockholders of the Corporation. Elections of directors of the Corporation need not be by written ballot unless the bylaws so provide. (b) Removal of Directors. Except as provided herein, any director may be removed from office by a vote of the stockholders at any time with or without cause; provided, however, that an ETP Holder Director, as such term is defined in the bylaws of the Corporation, may only be removed for cause. For purposes of this section, "cause" shall mean only (i) a breach of a director's duty of loyalty to the Corporation or its stockholders, (ii) acts or omissions not in good faith or which involve intentional misconduct or a knowing violation of the law, (iii) actions resulting in liability under Section 174 of the General Corporation Law of Delaware, or (iv) transactions from which a director derived an improper personal benefit. Any director may be removed for cause by the holders of a majority of the shares of capital stock then entitled to be voted at an election of directors, Duration SIXTH: The duration of the Corporation shall be perpetual. Bylaws SEVENTH: Except as may be expressly provided otherwise in the bylaws of the Corporation, the Board of Directors shall have the power to adopt, amend or repeal bylaws and rules of the Corporation. The bylaws of the Corporation may also be amended or repealed, or new bylaws of the Corporation may be adopted, by action taken by the stockholders of the Corporation. Any change to the bylaws that is required to be approved by or filed with the United States Securities and Exchange Commission (thc "Commission") before it may become effective under Section 19 of the Securities Exchange Act of 1934, as amended (the "Act") and the rules promulgated thereunder shall not become effective until the procedures of the Commission necessary to make it effective shall have been satisfied. Before any amendment to, or repeal of, any provision of the bylaws of the Corporation shall be effective, those changes shall be submitted to the Board of Directors of the Corporation and if such amendment or repeal must be filed with or filed with and approved by the Commission, then the proposed changes to the bylaws of the Corporation shall not become effective until filed with or filed with and approved by the Commission, as the case may be. 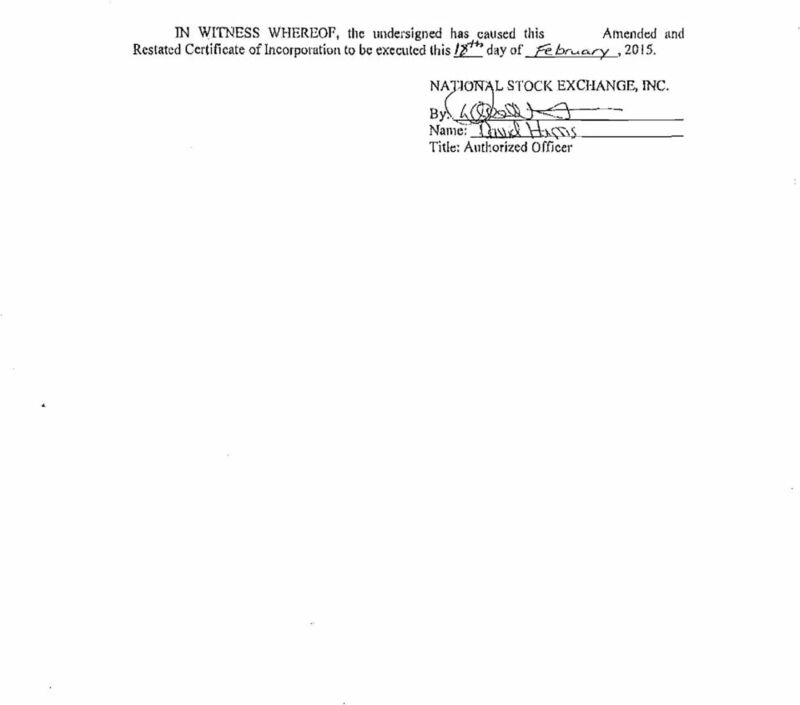 Limitation of Director Liabilitv EIGHTH: To the fullest extent not prohibited by the General Corporation Law of the State of Delaware, as it exists on the date this Certificate of Incorporation is adopted or as such law may later be amended, no director of the Corporation shall be liable to the Corporation or its stockholders for monetary damages for breach of fiduciary duty as a director. No amendment to or repeal of this Article shall adversely affect any right or protection of a director of the Corporation that exists at the time of such amendment or repeal with respect to any actions taken, or inactions, prior thereto. 4 Action without Meeting NINTH: Action may be taken by the stockholders of the Corporation, without a meeting, by written consent as and to the extent provided at the time by the General Corporation Law of Delaware, provided that the matter to be acted upon by such written consent previously has been directed by the Board of Directors to be submitted to the stockholders for their action by written consent. Compromise or Other Arrangement TENTH: Whenever a compromise or arrangement is proposed between the Corporation and its creditors or any class of them and/or between the Corporation and its stockholders or any class of them, any court of equitable jurisdiction within the State of Delaware may, on the applicadon in a summary way of the Corporation or any creditor or stockholder thereof, or on the application of any receiver or receivers appointed for the Corporation under Section 291 of Title 8 of the Delaware Code, or on the application of trustees in dissolution or of any receiver or receivers appointed for the Corporation under Section 279 of Title, 8 of thc Delaware Code, order a meeting of the creditors or class of creditors and/or of the stockholders or class of stockholders of the Corporation, as the case may be, to be summoned in such manner as such court directs. 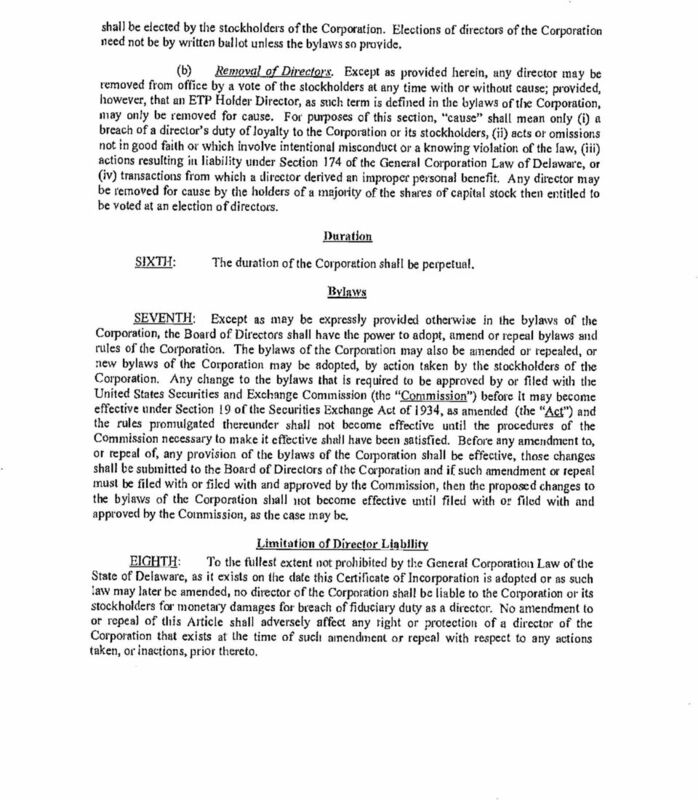 If a majority in number representing three fourths in value of the creditors or class of creditors arid/or of the stockholders or class of stockholders of the Corporation, as the case may be, agree to any compromise or arrangement and to any reorganization of the Corporation as consequence of such compromise or arrangement, the said compromise or arrangement and the said reorganization shall, if sanctioned by lite court to which the said application has been made, be binding on all the creditors or class of creditors and/or on all the stockholders or class of stockholders of the Corporation, as the case may be, and also on the Corporation. 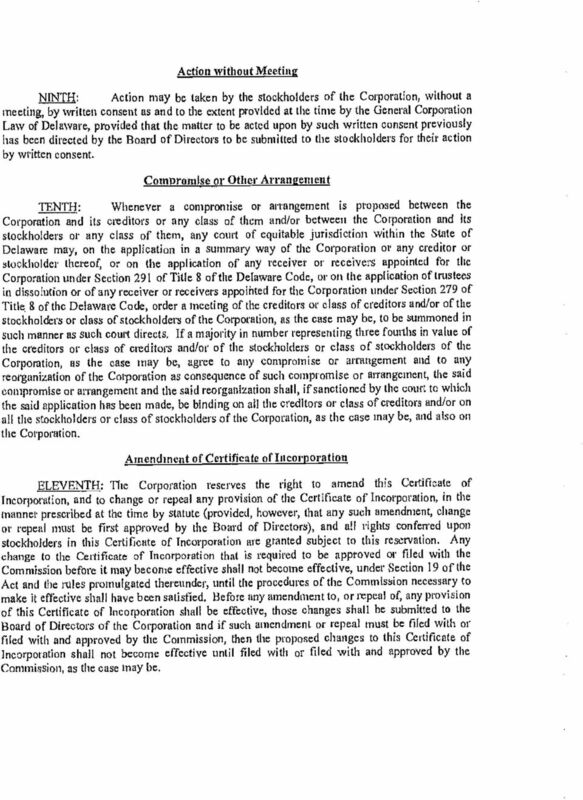 Amendment of Certificate of Incorporation ELEVENTH: The Corporation reserves the right to amend this Certificate of Incorporation, and to change or repeal any provision of the Certificate of Incorporation, in the manner prescribed at the time by statute (provided, however, that any such amendment, change or repeal must be first approved by the Board of Directors), and all rights conferred upon stockholders in this Certificate of Incorporation are granted subject to this reservation. Any change to the Certificate of Incorporation that is required to be approved or filed with the Commission before it may become effective shall not become effective, under Section 19 of the Act and the rules promulgated thereunder, until the procedures of the Commission necessary to make it effective shall have been satisfied. 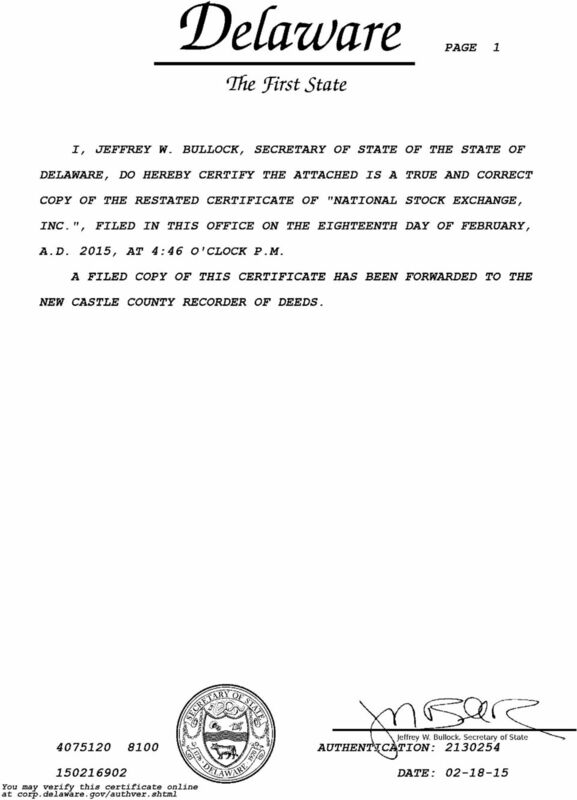 Before any amendment to, or repeal of, any provision of this Certificate of Incorporation shall be effective, those changes shall be submitted to the Board of Directors of the Corporation and if such amendment or repeal must be filed with or tiled with and approved by the Commission, then the proposed changes to this Certificate of Incorporation shall not become effective until filed with or filed with and approved by the Commission, as the case may be. COMPOSITE Certificate of Incorporation of AMR CORPORATION As Amended Effective May 26, 1998 COMPOSITE CERTIFICATE OF INCORPORATION OF AMR CORPORATION FIRST: The name of the corporation is AMR Corporation. SECURITIES AND EXCHANGE COMMISSION FORM 8-K GENSPERA, INC. RESTATED CERTIFICATE OF INCORPORATION of ROCKWELL AUTOMATION, INC. (As Restated April 29, 2002) FIRST: The name of the Corporation is RESTATED CERTIFICATE OF INCORPORATION OF ROCKWELL AUTOMATION, INC. 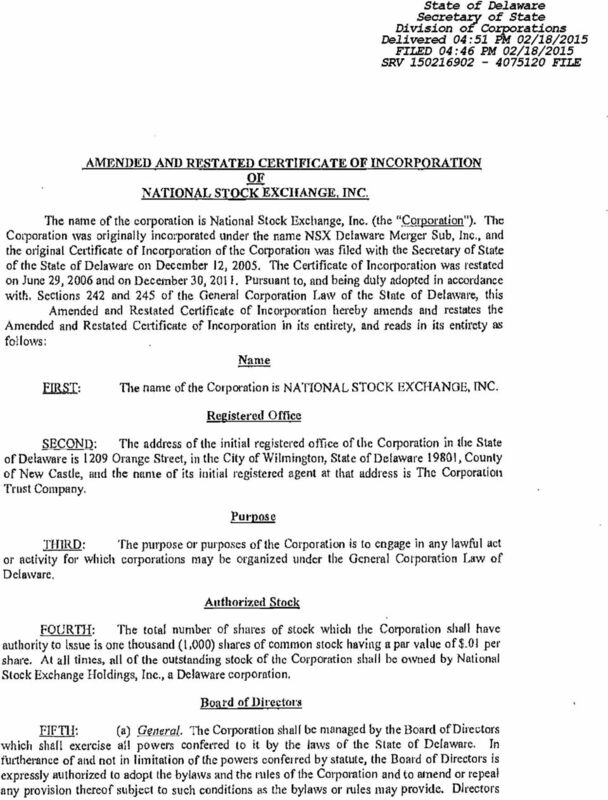 AMENDED AND RESTATED CERTIFICATE OF INCORPORATION THE GAP, INC.
Chicago Mercantile Exchange Inc. Exhibit H The Certificate of Incorporation, By-laws and Certificate of Good Standing are attached to this Exhibit H. Also attached is the charter for the CME Group Inc.